Customer satisfaction: do brands really care? In today’s world, queues are everywhere and so are the huge, serpentine waiting lines with lots and lots of people (customers, some of them new) waiting to be served. For a customer like me, this “forced wait” often comes with many other collaterals like an overdue parking ticket or a desperate wish to use this time for picking up some groceries, do the dry cleaning or simply grab a cup of coffee instead. But honestly, who cares? Or, put in another words, do brands really care? They do setup a big waiting lounge, put a split window AC, sometimes even put a couple of PS3 or XBox, have the same (boring) music on their customer service lines and think that their customers are having a good time! 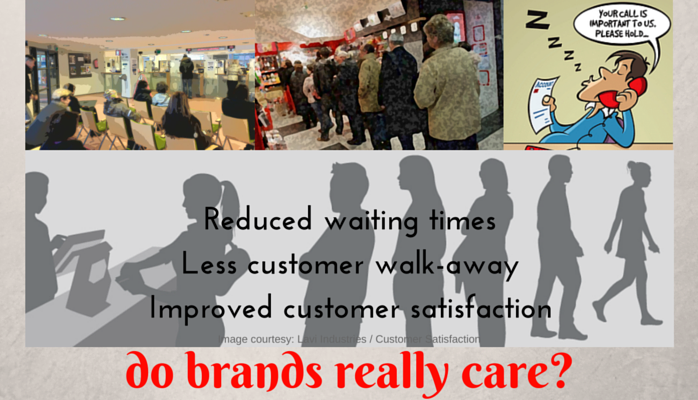 What they fail to understand is that “Waiting time is the single most important factor in customer satisfaction”. It doesn’t take long to create a negative impression. After about five minutes of waiting, a customer’s perceived waiting time is at least twice the actual waiting time. A study conducted a few years ago, suggested that US businesses lose an estimated $83 million in sales annually due to poor customer experiences. Again, my question is, do brands really care? Because its the customers who control what they perceive and that it does not take long to create a negative impression, often through word-of-mouth; the brands have to care about it. In most of the cases, its the small steps taken by these brands that matter to their customers. While I prepare myself for another post, I recommend you to watch this video about how Qtip.me works and have some food for thought.